James Tate is one of America's most respected and senior poets, whose influence is increasingly widespread. However, his whimsical play has long challenged critics to read him with any depth. After winning the Yale Prize in 1967 for his first book, The Lost Pilot, published when he was just twenty-three, Tate has since gone on to win major literary awards including the Pulitzer Prize, the National Book Award, and the Tanning Prize for Lifetime Achievement from the Academy of American Poets. This is the first monograph dedicated to Tate's uvre. The author provides a practical reading theory for Tate, complete with contextual frameworks. Close readings of Tate's work are informed by the purposeful purposelessness of Kant, the surrealist debt to Breton, and the problems and pleasures of language as explored by Derrida. 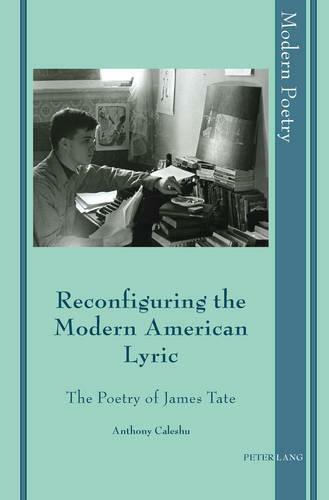 Tate's great achievement is no less than a reconfiguring of the modern American lyric as a poetry of dramatic and dialogic narrative. Composed out of `odds and ends ... of no great moment', as the poet himself writes, Tate's work extends the varied American traditions of writers such as William Carlos Williams, Wallace Stevens, John Berryman, and John Ashbery.